Last week, I headed to Peckham to try out the infamous Levan by the team that created Salon in Brixton. According to one of the founders, Nicholas Balfe, the place is named after their hero, Larry Levan, an iconic music producer and DJ who “tore up the rulebook and wrote the blueprint for what dance music would become. It’s this sense of freedom of expression that ties the work of Larry to the work of our favourite left-field wine-makers today, which will be a huge focus at the new restaurant. He changed the way people thought about music, and we’re seeing the beginning of a shift in the way that people think about wine.” I loved Balfe’s romantic idea behind this and it already starts the restaurant off on the right foot. Levan has large, light flooded windows with navy walls, dark wooden chairs and wine bottles neatly packed on the shelves. The kitchen was open plan with fresh vegetables hanging over the counter. They had a vinyl player blasting out some classic jazz, salsa and the service was impeccable. The owners have definitely brought the classy, French bistro vibe to Peckham! A few minutes after opening, the place was already packed with the morning crowd of laptop workers and pushchair ladies. 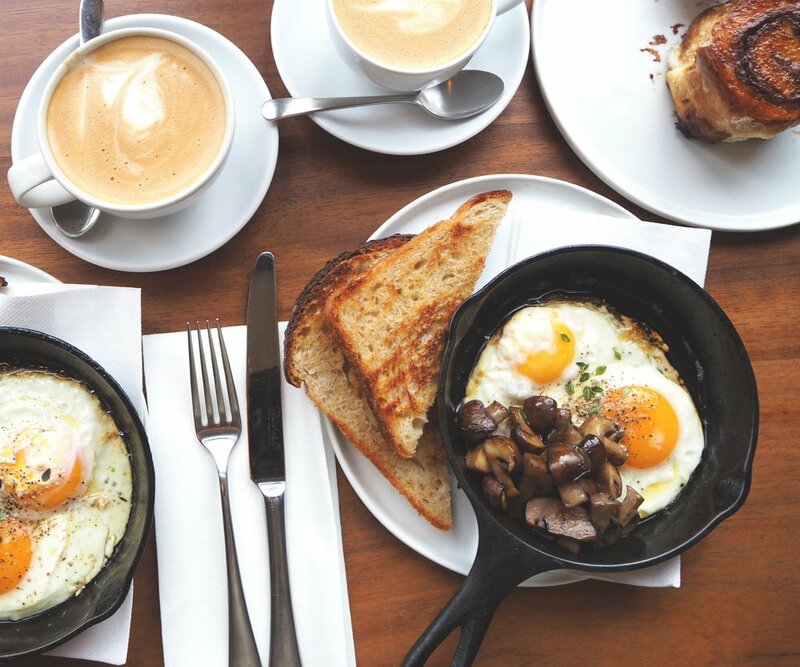 We went for brown butter fried eggs with mushrooms, sourdough toast, cinnamon roll, white chocolate miso roll and coffees which were around the £15 mark each. The eggs arrived in mini cast iron pans with the mushrooms still sizzling. Everything was simply put together but very good quality. It’s probably good that I don’t live round the corner or I would be in danger of buying the cinnamon rolls everyday. They were so soft and sticky, and although they were £3.50 each they were large. This breakfast experience made me want to book in for the dinner service. It would make a great date place and the food is mixed European with of course, an extensive wine list on offer. It’s worth a trip for breakfast through to dinner!